Two teams that met in the Eastern Conference Final last season suddenly felt like they were playing in a playoff series again. 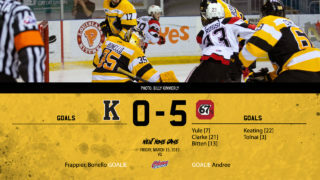 The Hamilton Bulldogs and Kingston Frontenacs played their third game in 16 days on Sunday afternoon at Leon’s Centre. The two teams split the first two meetings of the season, both getting a win on the road. Kingston took a 5-1 decision in Hamilton on November 3, but Hamilton got their revenge on November 9 with a 2-1 win in Kingston. 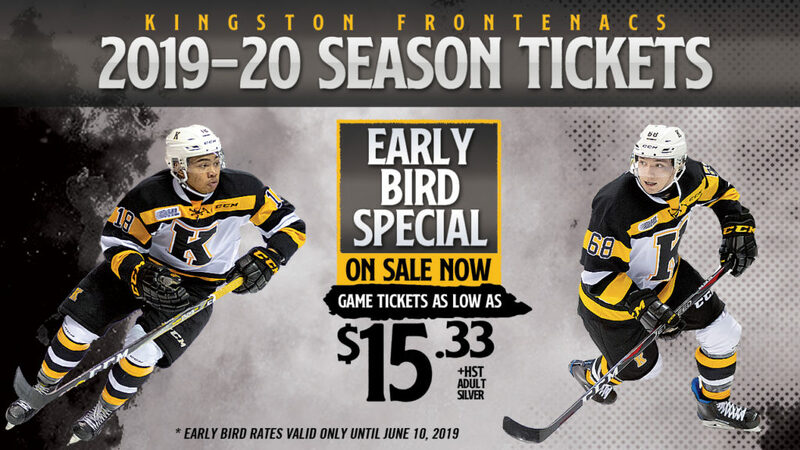 The Frontenacs were looking to be the first team to win a game at home in the series, as well as take a 2-1 lead in the season series, with a win on Sunday afternoon. The first period was an important one for Kingston after struggling early on Friday night. They responded with a very strong period. Jakob Brahaney scored the only goal of the period. It came on the power play at 8:23. He found a hole in goaltender Zachary Roy to put Kingston ahead 1-0. The Frontenacs pressure continued as the period progressed. When Hamilton did push back, Kingston goaltender Ryan Dugas was there to keep the score sheet clean. After twenty minutes, Kingston led 12-7 on the shot clock and 1-0 on the scoreboard. It was an eventful middle period. Michael Renwick tied the game for Hamilton with a point shot through traffic. 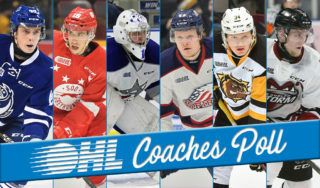 It was his first OHL goal. 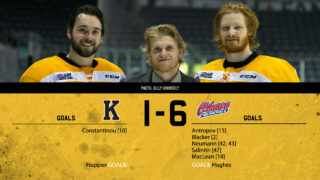 The Fronts responded well, specifically Brett Neumann. He scored his first of the game when Jason Robertson found him all alone in front of the net. Less than five minutes later, Neumann added to the lead. He cut to the slot area and slid a puck along the ice that bounced off the post, then the goaltender’s foot, and finally into the net for a 3-1 Kingston lead. Tim Fleischer brought Hamilton back within a goal with a gorgeous shot that beat Dugas on the glove side. It looked like that would be the score heading into the final period, but with two seconds left Tyler Burnie got his first goal of the season. Robertson found him in the slot and Burnie scored to Zach Roy’s blocker side. It was an important insurance goal and gave Kingston a 4-2 lead heading into the third period. Hamilton carried the momentum to open the third period. Kingston had a hard time clearing their zone and it started to feel like they would pay for it eventually. Arthur Kaliyev made that feeling come true. He threw a puck in front from behind the goal line that took a funny bounce off of Dugas and went in. It cut the Kingston lead to 4-3. That score held until late in the game when Kingston added some insurance. 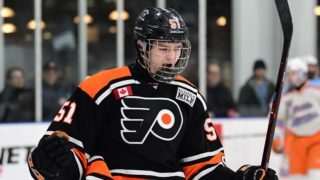 Lucas Rowe scored his first goal as a Frontenac. He picked the puck up at the side boards and snuck a perfect shot over the shoulder of Roy and off the crossbar and in. Hamilton pulled the goalie for the extra attacker but couldn’t get anything by Ryan Dugas. Kingston would hold on to a 5-3 win. Rowe and Burnie both scored their first goal of the season in the win. Jason Robertson, normally known for his goal scoring, took first star honors with four assists. 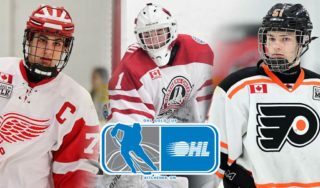 Brett Neumann scored two goals and Jakob Brahaney added another to make up the five Kingston goals. Ryan Dugas made 28 saves for the win. The Frontenacs hit the road on Thursday for a meeting with the Peterborough Petes. They return home next Friday night to host the Sarnia Sting on Teddy Bear Toss night. Fans are encouraged to bring a stuffed bear to the game and, immediately following our first goal, throw it on the ice. The bears will be donated to provide families in need with Christmas presents for their children.